For for third night when listening in Fredriksfors I went back without any new loggings. Almost nothing from NA. And the signals from the West Indies and northern LA were in most cases to week. There were quite a lot of stations but too low and too splattered to be identified. October 31st, 2010, will be the last day of transmissions from the Sölvesborg transmitter on 1179 kHz. The management of Radio Sweden has decided to stop all services on short and mediumwave. 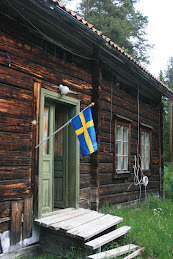 It is the end of a service to Swedes and listeners abroad that started in 1938. Log from Fredriksfors March 9th. DX-ing is on ”low” for the moment. The daylight is shorternng the dx-hours rapidly and signals do not propagate well, neither from north nor south. At my latest trip to Fredriksfors not much of interest was heard. It was so bad that I begun suspect that the antenna I used had been damaged by snow from the trees. Logs from Fredriksfors 28 Feb. Nothing new in the log book. Some LA in the beginning of the morning, but later on more signals from NA but mostly the usual dominants from the east coast. There were a few interesting signals but they ”drowned” in noise coming with the sunlight.